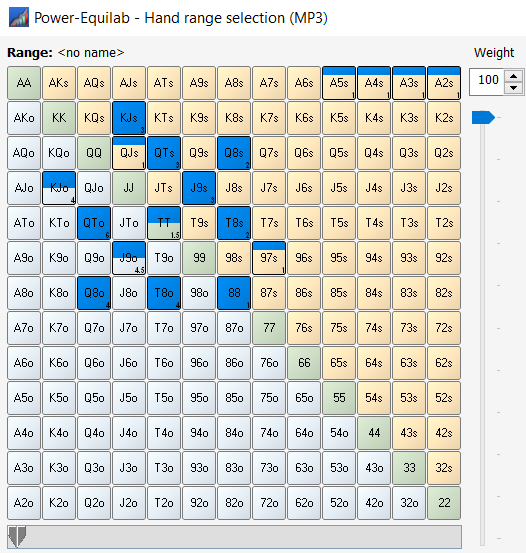 Here i think opp haven’t sets or AK straights (he would SQ PF), the unique hand that is beating me and is no folding is J9 and KJs. That Js reduce a lot his chances to have that hand, i will give him 12 combos of J9. 9 combos of QT, 2 combos of Q8s and 2 of Q8o, 5 combos of T8, some FDs and KJo. Q1: I think he is folding all this, so it’s a good bluff? Suggested answer: I don’t need to do this in order to win at NL25/NL50, stop overthinking. A1: I really like this movement, if villain calls with lets say QT, i think it would be a mistake cuz i have all the sets/AK/J9 combos, so next time just adapt and fastplay him really hard. Anyways, go to the numbers, according the given range, he is calling with 13 combos (J9-KJhh) and could call with 88 (37% of his range) but not sure. He is folding 24 combos (63% of his range), and i need 27% of FE (probably i screwed up this part) so my raise was good? Q2: Is calling better than raising? A2: If villain is doing that with any 2P, it’s a borderline call, cuz i have 14 outs to improve and i need 28% equity. Anyways i guess i have reverse implied odds here, i don’t like the call. I made the Assumption that he flats TT half of the time and J9o aswell. 9c7c would make a good Bluff raise with OESD and BDFD- Equity for him. When you jam the Turn, i dont think you get him to fold any 2 Pair+ Kind of Hands. A Jam pretty much only gets you to fold KJ – Hands and if you are lucky, he lays down his NFD, but i dont think he would for that prize. So i dont see a Point in Bluffjaming here. Best Play would be to Fold on the Turn. Your Gutshot brings in a 5 to Straight Board and you play the Board – and your FD Outs are not even clear outs. Hey man, thanks for the answer! I didn’t consider the 97cc bluff, but you are right it would be a great bluff. I don’t gave him TT cuz giving that he is an aggro reg i think he would SQ that. And for the same reason i didn’t consider him to flat with J9o OTF. It’s fair that you think he wouldn’t fold 2Ps here, but if he calls with that (i think it’s an overplay since i have all the sets/str8/and QJ combos) i would react to that by adapting and valuebet big him even weak sets here. Do you think i’m miss understanding the situation? Fold OTT would be a more solid play for sure, i’m agree with that. I just try to know if this could be an exploitative strategy or if i would just burn money by doing this haha. I think one of the key things in this hand is not discussed. This was not a HU pot on the flop. I don’t think BB raises 97cc on the flop against 2 players. BB has good relative position to you so he can also just flat call with draws (KJhh is of course in his raising range). And the CO seems bit of a fish. I think taking account all these things this raise is mostly value. And I don’t think he bets 4 straight board on turn with 2 pair (or he can if he’s retarded). Let’s say villain has QT… villain should check that like 100% of time. I would just fold the turn. maybe I´m not getting the point here… I would like to be clarified. Villain is getting 21% odds to call the turn, he raised big on flop, leads turn with a 64% pot bet and we are expecting him to fold after all by jamming our 4th pair and flush in 8, because we can have the str8, that´s it? Isn´t us supposed to bluff 4str8 boards only on river? I guess it is too much optmistic to expect a fold on this turn here after all this action. Like I said, maybe I´m missing some point , I play lower stakes, thanks in any comment, really wanna understand this play. I know we are not results oriented but I´m also curious about the result.. villain folds? Call? What he had? I don’t like the idea of giving him a frequency of 100% of something. I think he could raise 97cc 25% of the times (just that cuz it’s MW). What is that about relative position? I never used that. You say he must check 100% of the times with 2P OTT, and then what, fold or call if i bet? If you think x/c is better for him, i’m not agree. I like much more the b/f line than the x/c-x/f line. And again, i’ll not give him a 100% of check with his 2P. First of all his raise size was normal, you have to consider it was a caller after the cbet. The idea in here is shoving as a bluff with some equity. I’m not shoving for value. I consider he have much more folding combos than calling ones. Anyways, i assumed he should fold his 2P/FDs/88 here, but i don’t know if i’m wrong about this. If i know he is not folding that, i would never shove here and instead, would expand a bit my value range. 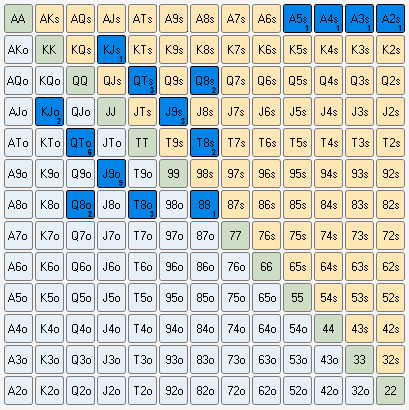 BB has best relative position to you (because you were the preflop raiser). Because in this case BB closes the action and he has the most information about the the hand on the flop. Let’s think about the case that CO wakes up with a monster, action could go like BB check, HERO bet and CO raises. BB can easily fold marginal holdings because he has all the information about the hand when action gets to him. Ohh i see i see, i didn’t know that concept. Thanks for the info juici!